A beauty sitting on a veranda is wearing a kimono tied at the front, where the year, Meiwa 2 (=1765), is also indicated. The scene is a travesty on Arhat Panthaka (Jap. Handaka Sonja) one of the Buddha’s sixteen closest disciples and usually depicted, like the other disciples, as a grim figure with expressive facial features. The print was commissioned by two vassals of the shōgun for the newly built observatory at Waradana in 1764. This enchanting print was designed as a calendar for 1765 with the name of the year period and the numerals for the long months of the year concealed on the woman’s sash. Two impressions of this state, neither with signature or seal are presently known, one in the Tōkyō National Museum (TMC 428), the other in the Museum of Fine Arts Boston. As was the case with many calendar prints, the date marks were removed when they had served their purpose and the print was reissued. Three impressions of this state seem to have survived, one in the Fogg Museum at Harvard University, one at the Minneapolis Institute of Arts, and one in the Riese collection. The Fogg and Minneapolis impressions have a strong purple on the woman’s robe, and strong traces of oxidation on the background. It is safe to assume that the designer of the print was not being simply whimsical but intended an allusion to some historical figure or legendary tale. But there is little agreement about who the young lady might actually be. 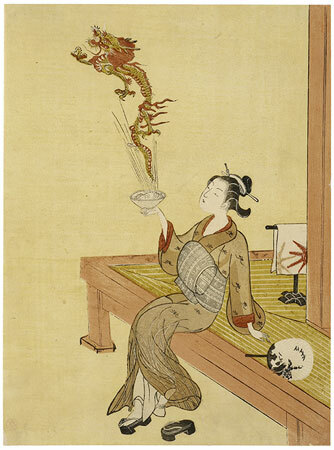 Mr. Tomita at the Boston Museum suggested that the reference was to the Arhat Handaka who one sees in Hokusai’s Manga perhaps, summoning a dragon as a familiar from a bowl. Mr. Kikuchi at the Tōkyō National Museum describes the print simply as a woman.